“It seemed like a good idea at the time” might as well be the motto of Silicon Valley, that stands out in particular with Apple's AirDrop. AirDrop is designed to be a tool for people who own Apple products to quickly share files with each other through WiFi or Bluetooth. Essentially, if you own an Apple device and share a WiFi network with another Apple device, in theory you can share files with coworkers, friends, or even total strangers. Used properly, it's a handy productivity tool. Misused, you can wind up with sexually harassing images, viruses, or worse. So how do you keep teens from the risks of AirDrop? Help teens be safe with their phones. Hit enter, and then log out of the Mac. Once you log back it, it won’t turn on unless you consent to it. If you or your teen need it for some reason, then you should configure the iPhone parental controls to only allow contacts and approved people to send files. Do you know what they’re getting? If you don’t want to start with the parental controls, then start with education. Teens should already know not to accept files from strangers, and fortunately, AirDrop needs your permission before it will download a file. Sit your teens down and talk to them about the risks both to their devices and themselves about AirDrop. If you have to leave AirDrop enabled, you should also talk to them about what to do if somebody tries to send unwanted images and files to them at school or at work, beyond declining to accept them. They should know who to talk to, when to confront and when to speak to authority, and how to get help if they feel unsafe. Another useful tool is parental control apps, which can lock down various aspects of a phone on a schedule or just lock off certain apps and behaviors altogether. This can do far more than just control files that arrive on devices, and it may be useful in situations where either teens need unfettered use of their devices, such as school or internships, or simply that you need to break a bad habit. The other bad side of AirDrop is that it’s also a method of “swapping notes” in class, which admittedly isn’t as harmful as the worst-case scenario, but teens need to pay attention in class! If you’re concerned about AirDrop, the internet, social networks, and other ways teens can experience the dark side of the internet, Screen Time can help, and you can try it for free. Is your child spending too much time on their mobile device? For many parents, it’s a tough question. Mobile technology erupted quickly and then spread like wildfire, and the result is that our kids have always had these devices, while we grew up almost entirely without them. How can you tell if your child’s reliance on smartphones and other mobile devices is normal when you have no frame of reference for childhood smartphone use, and when society has completely reorganized itself around mobile device use within your lifetime? 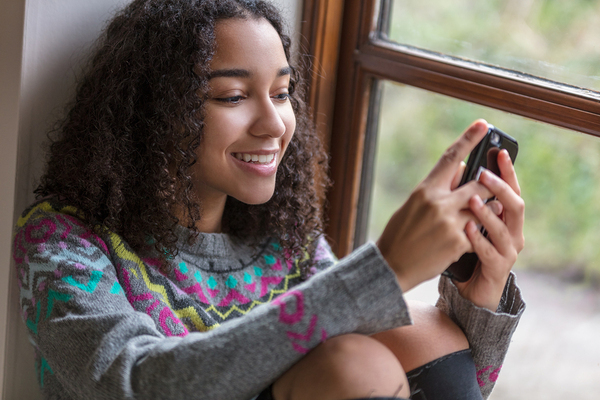 Here’s some important information about children and smartphone use, and some tips on how to deal with potential smartphone addiction in your tween. It’s important not to approach the idea of smartphones and mobile devices as automatically bad. After all, they are an integral part of your tween’s social life and an important communication device. And, if current trends continue, they’ll also be an important part of your child’s adult life. It’s likely they’ll be expected to have and use a smartphone or other mobile device in their professional life later on. Learning to handle these devices now can be a helpful thing for their future. On the other hand, too much of a good thing can always be dangerous. Some experts believe that smartphone use may be replacing drug and alcohol experimentation and addiction in teens due to a correlation between falling rates of tweens and teens who report drug use and rising rates of internet use. And while that may sound positive, experts also caution that it affects the brain in a similar way to using drugs. Withdrawal symptoms like anger, depression, irritability, and restlessness when the phone is taken away. Sleep disturbances and fatigue thought to be caused by the light from cell phone viewing after dark. If you suspect your child is addicted to their smartphone, your first instinct may be to remove the device entirely. That is an option, and it may be appropriate for some children. However, smartphones are part of modern life, and it’s unrealistic to expect your child will never use one again. Therefore, it may be advisable to treat smartphone addiction less like a chemical addiction and more like a food addiction. That means teaching your tween to moderate themselves. Set boundaries for smartphone use. You may want to limit your child to a certain amount of time on their smartphone each day, or to designated times of the day, or both. It’s also important to keep an eye on what they’re doing and limit online activities that your kids spend an unhealthy amount of time on, like social media sites or games. Parental control software can help you set and enforce healthy boundaries on your tween’s screen use. The Screen Time app is a great tool for achieving this and more. To get an idea of how it works, try it for free.